Mobile phone subscribers in 2003 (download KMZ). 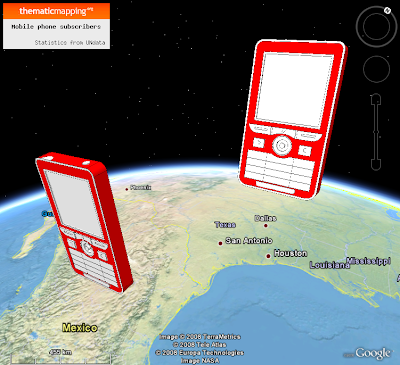 3D phone from Mikeyjm/3D Warehouse. I'm using volume as the scaled parameter, which I think is more accurate than using area or height. 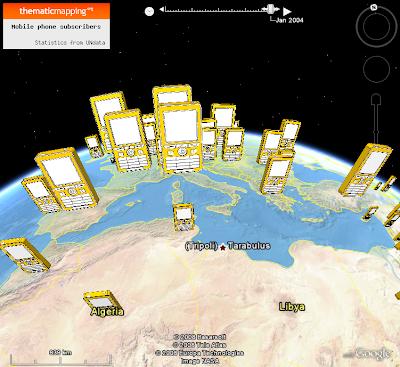 I've added a 3D mobile phone and a 3D person (both from 3D Warehouse) to the Thematic Mapping Engine, so you can make this visualisation yourself. I'd love to see a visualization of the Big Mac index (this data) using 3D burgers! BTW: I disagree that the 3D perspective takes away from the 'accuracy' of the data representation. The eye is extremely good at coping with relative sizes in perspective - especially when the 3D visualization can be spun around... However the color ramps definitely do help and the 2 techniques together make a very compelling representation.